We wrote in the May 2014 issue editorial that technical editor Jerry Powlas has finally completed the refit of his C&C Mega 30 after only 11 grueling years. This, as you may recall, was the project he hoped to complete in two years. Let's just say that he learned a number of important and humbling lessons along the way. But now he's celebrating and we're all celebrating with him. You're invited to come meet the editors and see Sunflower, the Mega 30, and all her innovations at the Good Old Boat launching party and open house on the afternoon of Sunday, June 29, in Superior, Wisconsin. The details are posted on our site at <http://www.goodoldboat.com/pdfs/GOBInvitation.pdf>. There'll be an impromptu band. Bring your own instrument if you play something. We'll have door prizes. We'll have food and non-alcoholic beverages. If you prefer something with a bit of alcohol in it, feel free to bring your own. It wouldn't be wrong to bring your own folding lawn chair either. Please let us know if you're coming by sending an email message to karen@goodoldboat.com by June 18. We plan to have enough food and drink on hand to feed an army but we need to know the size of that army. Wow! We just received boxes and boxes and boxes of our newest two T-shirt designs. We keep tweaking and improving our big logo shirts based on the feedback we get from you. The new ones are a deep dark heather gray with a blue and white logo and a deep burgundy shirt with a gray and white logo. We're thinking you'll need the wine-colored shirt for formal occasions when wine will be consumed. Think how that takes the stress off the situation if a wee small amount gets spilled. No problem! Meanwhile, once it has gone past the brand-new stage, the heather gray will be a great all-purpose work shirt capable of hiding any accidental boat grubbiness with style! Some of our older styles are also available while supplies last, but we're phasing them out. Check soon if you hope to replace a favorite shirt in your collection. We've just gathered another batch of boat reviews for you. This collection includes 31- to 36-footers that we covered as review boats through the end of 2013. The list of 33 sailboats includes many favorites such as the Alberg 35, Columbias of 33 and 35 feet, Contessas of 32 and 35 feet, Ericsons of 32 and 35 feet, the Nicholson 31, the Pearson Vanguard (32.5 feet), the Santana 35, the Ranger 33, the Southern Cross 31, and the Westsail 32. To keep things interesting, it also includes a few not-as-well-known sailboats. These downloadable collections of articles, called Archive eXtractions in "Good Old Boat Speak," are available through our downloads site: AudioSeaStories.com. We sell them for $25. You can preview the entire list of 33 boats in the collection before making any commitment. Other review boat Archive eXtractions include 25- to 27-footers and 28- to 30- footers. "It is with a heavy heart that we share the news that Ted passed away peacefully at home on May 15, 2014. As many of you know, it has been a difficult struggle for both Ted and Jan since his stroke almost 5 years ago . . . but even so he kept on adding value to everyone's lives right until the end." At some point in the not too distant future we will find a way to celebrate his life and achievements properly. This summer, New Bedford, Massachusetts, will welcome the iconic Charles W. Morgan for its 38th voyage. The Morgan is the oldest commercial ship still afloat and the last wooden whaleship in the world. The only older ship afloat in the United States is the USS Constitution. The Charles W. Morgan launched from New Bedford in 1841, made its last visit to New Bedford during World War II, and will return home to the nation's most iconic whaling city in late June. The Morgan was designated a National Historic Landmark by order of the Secretary of the Interior in 1966, and she has also been recognized with the prestigious World Ship Trust Award. She has welcomed over 20 million visitors at Mystic Seaport. The Morgan's journey will begin in Mystic, Connecticut, where the ship currently resides, and head north to various ports in Connecticut, Rhode Island, and Massachusetts. In New Bedford the ship will be open to the public featuring a State Pier dockside exhibition program including demonstrations, music, and the opportunity to explore the whaling vessel. For more information on the Charles W. Morgan and its voyage, including a complete itinerary, go to <http://www.mysticseaport.org/visit/explore/morgan/>. "If a car's vanity license plate can tell you a lot about the person behind the wheel, what can a boat's name tell you about the person behind the helm? Boat Owners Association of The United States (BoatUS) just released the national boating organization's 24th Annual Top Ten Boat Names List and may have the answer. "Need a boat name? BoatUS has over two decades of top ten boat name lists and over 9,000 names in its online Boat Name Directory, a checklist to help pick a name, christening ceremony information, and an easy-to-use online design tool to make your own boat name, all at BoatUS.com/boatgraphics." In the April newsletter a reader asked others for their favorite sailing tunes. Here are the ones suggested. If you have additional tunes to mention, send an email message to karen@goodoldboat.com. "Redfish Island" album – Kelly McGuire has several sailing songs, such as "Turn Around and Run," "They All Wanna Go to the Sea," "Redfish Island," "Major Doubts About Waterspouts," "Hurricane," "Where did Redfish Go," "Pensacola in the Morning," "Sailing Across the Gulf on my Own," and "Therapy Cruise." The "Sea Music" album – Dan Zanes has some great songs according to one reader who notes, "The worst tune beats the snot out of Christopher Cross and Styx." From his "Fresh Water" album, Canadian Stan Rogers includes "White Squall," "The Nancy," "Man with Blue Dolphin," "Tiny Fish for Japan," "Lock-Keeper," and "The Last Watch." "Between the Breaks" album – Stan Rogers includes "The Witch of Westmoreland," "Barrett's Privateers," "The Mary Ellen Carter," and "Rolling Down to Old Maui." "Northwest Passage" album – Stan Rogers includes "Northwest Passage" and "Night Guard." "Fogarty's Cove" album – Stan Rogers includes "Fogarty's Cove," "The Maid on the Shore," "Fisherman's Wharf," "The Wreck of the Athens Queen," and "Make and Break Harbor." "Seaway" album – David Francey and Mike Ford (also Canadians). This one includes 16 original tunes about the lakes, the boats, and the people on them. The soundtrack from the Hornblower series. Any number of sea chanties such as "Haul Away Joe" and "John Kanaka." Really like sailing tunes? Mystic Seaport is hosting its 35th annual Sea Music Festival June 12-14. For more information: <http://www.mysticseaport.org/event/sea-music-festival-2/>. Susan says, "Back when we discovered this song we kept two electric pumps and two manuals on hand and on a hard beat both the electrics were sometimes in use:"
But it's pump me boys before we drown. We're just a thousand miles from home. I'm sure we've pumped this bit before. Chorus and so on . . .
Summer Sailstice encourages all sailors, from the recreational to the professional, to sign up at <http://www.summersailstice.com>, a social network where they can share their individual sailing plans, recruit crew, post stories and create Summer Sailstice events with their yacht clubs, fellow sailors, or sailing associations. All sailors, regardless of vessel or location, are encouraged to sail "together" wherever they happen to be on the planet. By registering to participate each year, Summer Sailstice celebrants become eligible to win prizes supplied by over 400 sailing industry supporters, including Footloose, Hobie, Offshore Sailing, West Marine, Boat U.S., Harken, Lewmar, Good Old Boat, of course, and numerous other respected marine suppliers. The prize list is topped by a $5,000 certificate toward a BVI charter with Footloose Charters. Winners are selected by a random drawing in early July 2014. This year, Canada Day (July 1) falls on a Tuesday, and the event will be kicked off with a parking lot full of vendors, a pancake breakfast and day long entertainment. The traditional singing of "Oh Canada," and cake cutting ceremony will take place at high noon. The sailing races will start shortly after. The Sointula Dragon Boat will be on hand for rides and the Royal Canadian Marine Search and Rescue (Station 50) will be available to conduct free safety inspections. The Lion's Club will be hosting a daylong beer gardens and the Burger Barn will be offering up a delicious menu. For those that do not know, Sointula is on Malcolm Island, at the northwest end of Vancouver Island on the "Inside Passage," across from Port McNeill. It is the gateway to the Broughton Archipelago. More information can be found on the Canada Day regatta website, <http://www.sointulacanadadayregatta.com>, or call Jim MacDougall at 250-973-6975. The Macatawa Bay Yacht Club of Holland, Michigan, will host the Lake Michigan Catalina Association's 20th Annual Rendezvous. This will be a grand celebration of a tradition started 20 years ago by a handful of Catalina owners dedicated to sharing their love of sailing and Catalina/Morgan yachts. Last year's Friday night Smokin' Rib dinner was a great hit and will be back again this July. After sailing, shopping, seminars, and the infamous Tour de Boats on Saturday, sailors will be ready for some great food and a good time. The MBYC hosts don't disappoint; dining there is always first class. Again this year we will feature the up and coming country band "Small Town Son." Great party, great music, line dancing, and even "Lazer Fingers" — it will be a great time. For more information go to <http://www.LMCA.com/>. The Sippy Cup is an overnight regatta, held the same weekend as the Governor's Cup. There are three fleets — Regatta, Sippy Cup, and Big Gulp. The Regatta Fleet is open to any sailboats — entrants sail for fun and bragging rights, will not be scored, and there is no trophy. Sippy Cup boats must have a PHRF rating of 220 or higher. Big Gulp boats must have a PHRF rating of 160 – 219. If you don't have a PHRF rating, contact us and we will determine where you belong. Hosted by Walden Rigging, this is primarily a regatta "fun race" encouraging small boats and everyone else to gain experience sailing at night. The entry fee is $15 due by July 11, 2014. For more information contact Suzanne and Dobbs at Waldenrigging@earthlink.net or call 410-441-1913. The Newport Exhibition Group has announced the 44th Annual Newport International Boat Show at the Newport waterfront along America's Cup Avenue in Newport, Rhode Island. The premier boat show in New England will encompass 13 acres and will host hundreds of exhibitors from around the world with power and sailboats ranging from 15 to 85 feet, plus a wide variety of accessories, equipment, electronics, gear, and services for boaters. For more information or to purchase tickets go to <http://www.newportboatshow.com>. My wife and I would love to restore and live aboard a good old boat. Having spent a good portion of my life on the coast, I've seen many derelict boats. It drives me crazy that people let them die instead of passing them on to someone who will take care of them. We're looking for someone with a bluewater, older, longer (40- to 50-foot) sailboat who would love to see a family take it for another spin or two. I work at Traditional Boat LLC in Unity, Maine, doing finish work. One project I received was a wheel that needed attention and new ropework. My boss, John Flanzer, reads your magazine routinely and gave me the issue (March 2013) with David Lynn's coachwhipping article. It helped me out greatly! The pictures with different-colored strands were excellent guides to get me started and so was the photo of the wheel in progress, which was a good visual for what you should be seeing as you work. I had never tried coachwhipping before and I looked at this beautiful wheel I had been finishing and refreshing with new horror! I contacted David with several questions and, thanks to the very instructive article and his further help, the wheel came out absolutely amazing. One thing I would add to David's article was that each strand had to be pulled very tight with fine-nosed pliers or tweezers. This tightened the braidwork so the rope hugs the wheel and will not slide or twist. A trick that sped up tightening each strand was, when following the coachwhipping down or toward yourself as you work, look at it as columns. Tightening a column of strands that went left, with the column next to it going right, actually tightened all strands around the wheel. Simply working with two columns as I went seemed to efficiently tighten all my cords. I tied off my coachwhipping with a rubber band to keep my work from unraveling. Using a second rubber band about 6 inches behind, at the end of each section I had pulled tight with pliers kept strands in that section from loosening again. It then became an easy process of coachingwhipping several inches followed by tightening several inches. I owe so much to the crew at Traditional Boat for instructing me in so many ways and to my boss for teaching me new skills and offering opportunities like this to learn and keep moving forward. I'm very lucky to work with an open-minded crew in such an enthusiastic environment. Thank you again Good Old Boat and David Lynn for all the help and instruction! My wife and I painted our topsides with Awlgrip a few winters ago, using the instructions we found in Randy Baker's article, "Perfect Topsides," November 2010. Thanks to that excellent article, everything went pretty smoothly. If it's very warm out, you'll probably want to thin the Awlgrip 545 primer, even though the instructions say not to. We found that if we wanted to see the wet edge, we had to paint as the sun shone along the hull toward us. By early afternoon, the Florida sunshine heated the hull enough that the primer cured before it all flowed together, leaving the warmest areas with small pinholes. Following coats did not seem to fill these imperfections, so they had to be sanded out. We tried the recommended 7-inch foam rollers (from West Marine) but were unhappy with the results we got. Those rollers had a diagonal seam that left a distinct pattern on the hull, and their hard edges took a good deal of "tipping" with a brush to eliminate. We found we much preferred using shorter 4-inch foam rollers. The convex-ended ones from Home Depot did a good job but are for conventional paints and dissolved pretty quickly in the strong solvents. "Whiz" rollers, which we found at Ace Hardware, were able to stand up to the chemicals and their concave ends did a nice job feathering the edges. We just rolled on thin coats of Awlgrip and didn't mess with any tipping. We only used half the volume of paint that the articles and experts predicted. That was only 2 quarts of paint for 5 coats on our Hallberg-Rassy Rasmus (35 feet x 10 feet)! The stuff goes on incredibly thinly and is tripled in volume by the "converter" and "reducer" you add. So don't overbuy this expensive stuff. We had some of the Awlgrip 545 epoxy primer left over from the job. We also had some funky spots around our cockpit where epoxy had been used to patch various holes in highly visible areas. We never could get gelcoat to cure on these surfaces, no matter how much we sanded and washed that amine blush away. The polyester resin just wouldn't set up on these patches, and made a tacky mess when we tried. But one of the claims of the 545 product was low amine blush, so we experimented with painting a layer of this primer over the epoxy patch. It cured nicely. We then gelcoated over this epoxy primer and finally got the resin to cure! So we now have a way to gelcoat epoxy repairs without having to paint the whole darned deck. 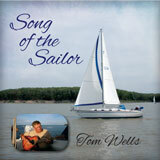 No boat would be truly a boat without the two new CDs by Tom Wells sitting next to its stereo. I just received mine today, have been listening to them, and I guarantee they pass the test for good listening. The genre is country. He accompanies himself playing a really nice guitar and some of his songs are real toe-tappers. Send an email to Tom, t37224@centurytel.net to order your CDs. Yes, this is an advertisement. Yes, I know Tom personally. Yes, Tom is a friend. And yes, I am impressed. Tom's albums are available to download on Audioseastories.com -Eds. In the March issue of the newsletter, we got photos a little mixed up in Peter Burgard's article about Berheenya. We'll try again. Thanks to our sharp-eyed readers for letting us know. – Eds. Two sets of photos were forwarded to GOB, one — Berheenya, a 1970 Santana 21— was purchased and restored by Alan. The second, the 1963 Islander 32, is undergoing rehab by Alan's parents (that would include me) — a new interior, electric engine, sails, windlass, etc. Sorry, the correspondence may not have been labeled accurately.